I spent 13 weeks in Milan across a 2 year peridot for my old job; sometime I would fly home just for the weekend – sometimes there would be 8 weeks or more between trips. All that time spent in Italy for work meant I ate a lot of Italian food; I had a hotel breakfast followed by a 2 course lunch and a 3 course dinner every evening with plenty of snacks and gelato in between! so I know an authentic Italian brand when I taste one! When Ciao Gusto got in touch and asked me to create a recipe using some of their products I jumped at the chance. My first thought was Steak; I ate a lot of Steak in Italy and it always came with the most divine potato sides and salads. 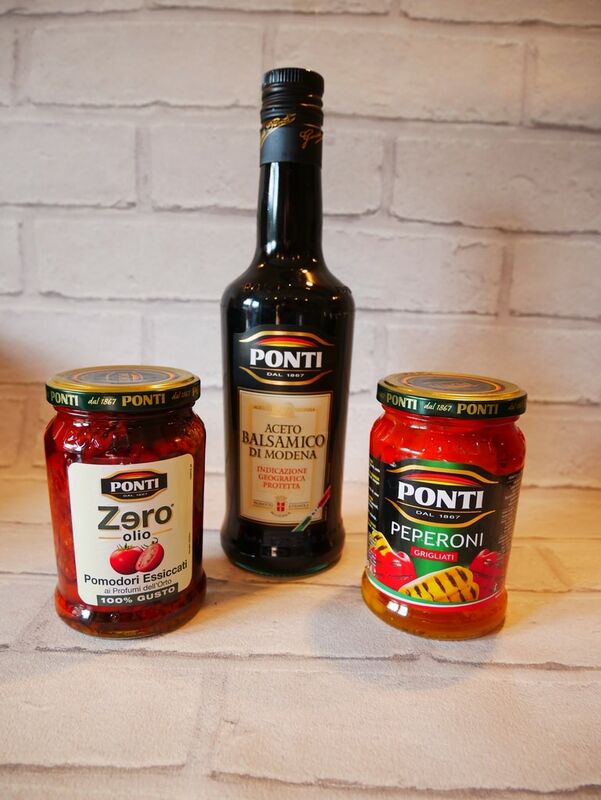 I had a look at the Ciao Gusto range on Ocado and decided to buy the Ponti Aceto Balsamico Di Modena, the Ponti Peppers and the Ponti Sun Dried Tomatoes. I set then set about to create my own Italian themed meal. It was absolutely delicious! If you want to create an authentic tasting Italian meal then take a look at my recipe below. Put the rocket leaves on the bottom of your salad plate to line it. 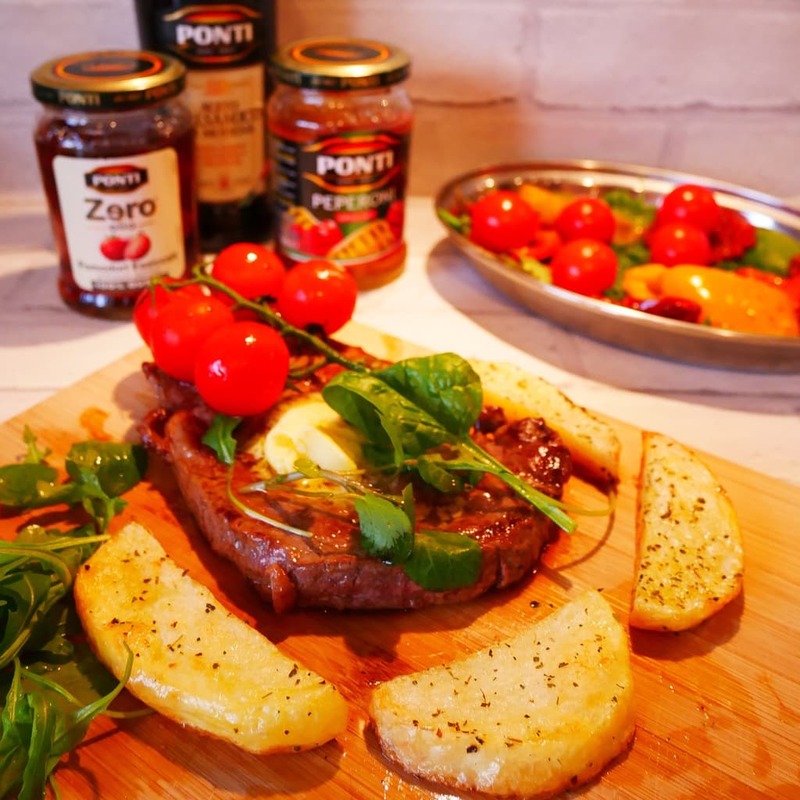 Place the Ponti Sun Dried Tomatoes, Ponti Peppers on top and garnish with half of the on the vine cherry tomatoes. Splash a good amount of Ponti Aceto Balsamico Di Modena over the top. Pop the salad in the fridge with some tin foil over until serving. Prepare a pan of boiling water. Peel potatoes and chop into chip shapes by cutting them in half then slicing along them lengthways – try and cut them to the same thickness to ensure they cook evenly. Preheat oven to 200C. Boil the potatoes for 5 minutes. Drain the potatoes using a colander and place them on the baking tray. Splash Olive Oil over the top of the potatoes and sprinkle on some oregano. Put in the oven for 50 minutes. 15 minutes before the chips are due out of the oven heat a little Olive Oil in a frying pan to cook the steak. Cook the steak over a medium heat for 5 minutes on each side for a medium cook. Serve the chips, steak and salad and enjoy! Hope you enjoy this recipe and this little taste of Italy! Disclosure: We went gifted the ingredients for this post in exchange for a review of the Ciao Gusto Ponti range.